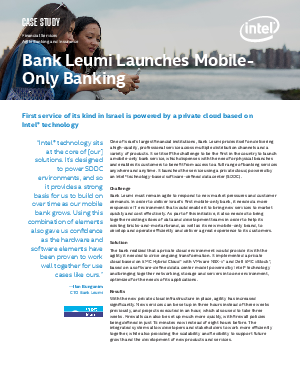 This case study will look into one of Israel’s largest financial institutions, Bank Leumi. It set itself the challenge to be the first in the country to launch a mobile-only bank service, which dispenses with the need for physical branches and enables its customers to benefit from access to a full range of banking services anywhere and anytime. It launched the service using a private cloud, powered by an Intel® technology-based software-defined data center (SDDC).